Since the mid-2000s, the al-Qaeda-affiliated militant group al-Shabab has destabilized Somalia and the Horn of Africa by perpetrating acts of terror and violence. Despite recent rumors of al-Shabab’s declining power and influence, many experts believe that the group could experience a resurgence soon. For decades, Somalia has suffered from countless political, economic, and environmental crises. The fall of Mohamed Siad Barre’s 22-year dictatorship in 1991, the collapse of the central government, and fighting between competing clans have left the East African country in total disarray. 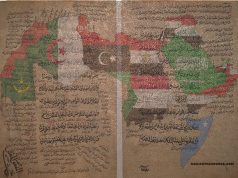 Somalia’s civil war made the country an ideal haven for radical jihadists, like the militant Salafi group al-Ittihad al-Islami (AIAI, or “Unity of Islam”), which rose to prominence in the 1990s. AIAI’s core membership was comprised of Somali extremists educated in the Middle East and partly funded and armed by al-Qaeda’s notorious leader, Osama Bin Laden. A rift developed in AIAI in the early 2000s, when the organization’s more moderate senior members decided to create a political front, while its younger members “sought the establishment of a ‘Greater Somalia’ under fundamental Islamic rule.” This schism resulted in the formation of a different militant group: al-Shabab, or “youth” in Arabic. Since then, the radical youth have consistently undermined Somali and international attempts to restore peace to Somalia. Last week’s terrorist attack in Kenya has also renewed concerns about al-Shabab’s recurring threat to the stability and security of the Horn of Africa. The newly-formed al-Shabab joined forces with the Islamic Courts Union (ICU), an alliance of hard-line Sharia courts in southern Somalia, and served as its youth militia. The newly-formed al-Shabab joined forces with the Islamic Courts Union (ICU), an alliance of hard-line Sharia courts in southern Somalia, and served as its youth militia. In 2006, al-Shabab fought an insurgency against Somalia’s internationally-mediated Transitional Federal Government (TFG), which was set up in late 2004. In June of the same year, al-Shabab and ICU successfully seized control of the capital, Mogadishu, provoking fear in Somalia’s neighbor, Ethiopia. Six months later, U.S.-backed Ethiopian forces joined TFG troops and successfully forced ICU and al-Shabab out of Mogadishu. When the TGF returned to power in 2007, the United Nations Security Council authorized the African Union to lead a peacekeeping force to protect the newly-restored government. The African Union Mission to Somalia, also known as AMISOM, is a peacekeeping force comprised of 22,0000 troops from Uganda, Burundi, Ethiopia, Kenya, and Djibouti. While AMISOM tried to restore peace in Somalia in the late 2000s, al-Shabab began to plan terrorist attacks beyond the country’s borders. In 2010, the terrorist group executed suicide bombings that killed 74 people in the Ugandan capital of Kampala, marking its first attack outside of Somalia. “We are sending a message to every country who is willing to send troops to Somalia that they will face attacks on their territory,” Ali Mohamoud Rage, an al-Shabab spokesman, told reporters in response to the attacks. Ultimately, analysts have attributed the growth, militarization, and radicalization of al-Shabab to the interventions of Ethiopian and AMISOM forces. When Addis Ababa forced ICU leaders to flee Somalia, they eliminated the only “moderating influence” on al-Shabab, according to Rob Wise, a counterterrorism expert. After the collapse of the ICU, al-Shabab became even more radical, driving them to sever ties with other Somali organizations. The terrorist group exploited Somalis’ discontent and resentment toward Ethiopia in order to recruit thousands of volunteers to their cause. Al-Shabab’s membership grew from a few hundred fighters in 2006 to thousands in 2008. The radical group garnered considerable support from Somalia’s south-central populations, allowing it to gain control over large territories in those regions, including the important port city of Kismayo. While ICU members fled to neighboring countries, al-Shabab retreated to southern Somalia, where it evolved into a full-fledged insurgency, using hit-and-run attacks, improvised explosive devices, assassinations, and bombings to hinder Ethiopian advances into the south. Ahmed Abdi Godane became the leader of al-Shabab in December 2007. Three months later, the U.S. State Department designated al-Shabab a foreign terrorist organization. In 2012, under Godane’s leadership, al-Shabab declared allegiance to al-Qaeda’s now deceased leader Ayman al-Zawahiri. After a U.S. airstrike killed Godane in 2014, Ahmad Umar, also known as Abu Ubaidah, became the new leader of the terrorist group. Despite some internal divisions that emerged within al-Shabab’s ranks between 2012 and 2013, the terrorist group still “remains a largely unified organization” under Umar’s leadership. Al-Shabab enforces a harsh interpretation of sharia law in the areas it controls. In addition to prohibiting various types of entertainment, such as movies and music, the terrorist group also prohibits the sale of khat (a narcotic plant chewed throughout the Horn of Africa and the Arabian Peninsula), smoking, and men shaving their beards. Al-Shabab also punishes various crimes with stonings, amputations, and beheadings. 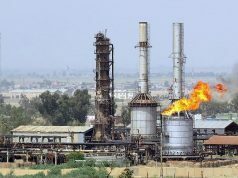 During the famines of 2011 and 2017, the terrorist group blocked the passage of humanitarian aid to areas under its control and told its residents that they would be punished or executed as spies if they contacted humanitarian agencies. During the famines of 2011 and 2017, the terrorist group blocked the passage of humanitarian aid to areas under its control and told its residents that they would be punished or executed as spies if they contacted humanitarian agencies. In some towns, al-Shabab even went as far as ordering its hungry and weak residents “to act as human shields against U.S. airstrikes.” Even though Western nations have sent millions of dollars in foreign aid to eliminate al-Shabab from Somalia, the group has appropriated this aid and now uses it to finance its operations. 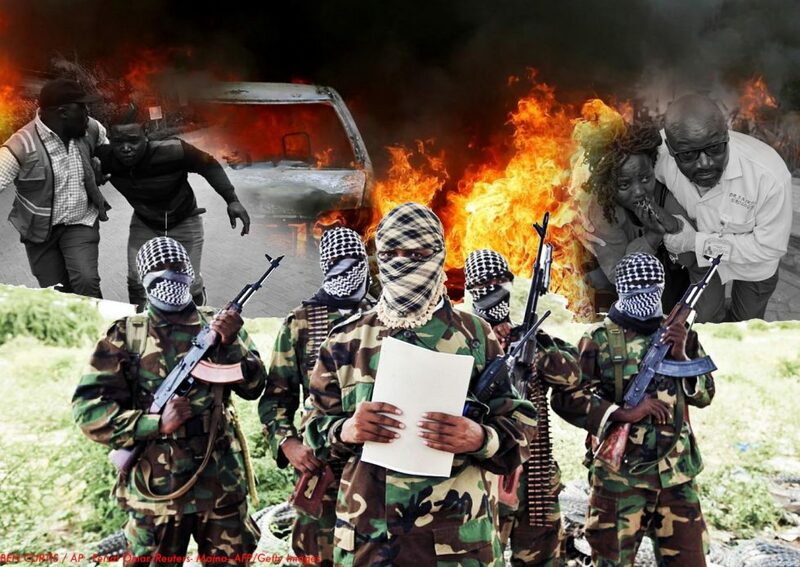 In addition, al-Shabab extorts thousands of dollars per day through roadblocks and “taxes” that its members enforce “through violence and intimidation.” The terrorist organization has generated millions of dollars by illicitly trading charcoal and smuggling contraband sugar across the border into Kenya. 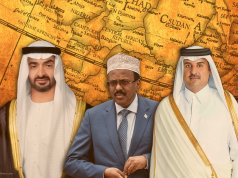 Over the years, al-Shabab has also received financing from other sources, including terrorist groups, state sponsors, members of the Somali diaspora, and some Middle Eastern governments, including Saudi Arabia’s. Is the Influence of al-Shabab Declining? Although a U.S. State Department report stated that “al-Shabab experienced significant military pressure during 2017,” Somalia continues to be a “safe haven” for the terrorist group, which still has between 7,000 to 9,000 fighters. Despite the major territorial losses that al-Shabab has suffered in recent years, the lack of a strong central government, jobs, and education opportunities for Somalia’s youth allow the group to easily infiltrate and recapture old territories, rendering the terrorist group an ever-evolving threat. “Al-Shabab remains a potent threat, despite—or perhaps precisely because—it is on the back foot as a result of financial pressures, counterterrorism operations, and airstrikes,” former UN envoy Michael Keating told Security Council members last January. “Al-Shabab remains a potent threat, despite—or perhaps precisely because—it is on the back foot as a result of financial pressures, counterterrorism operations, and airstrikes,” former UN envoy Michael Keating told Security Council members last January. AMISOM’s plans gradual withdrawal from Somalia, beginning in February 2019, which could provide the perfect opportunity for the resurgence of al-Shabab. Even though military forces, international humanitarian organizations, and Somalis worldwide continue to fight for a better future for Somalia, nothing will change until Mogadishu can find long-lasting solutions to its most pressing political, social, and economic issues. In the meantime, al-Shabab’s violence and terrorist attacks will continue to magnify the tragedy of the Somali people and further destabilize the Horn of Africa.